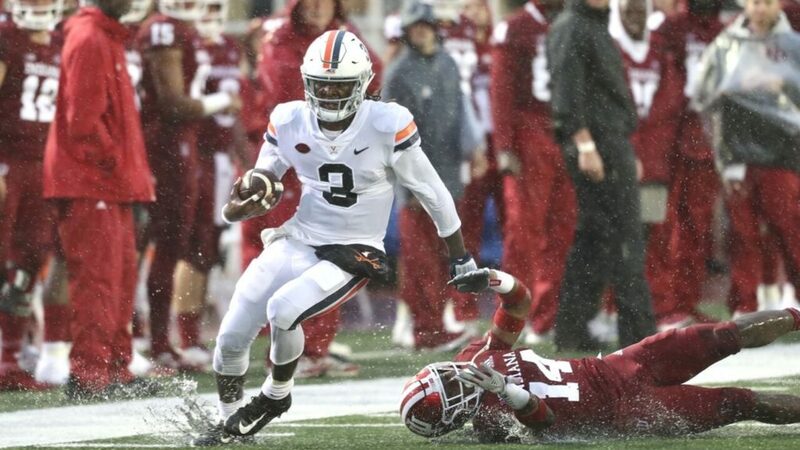 With the game on the line and no time remaining, University of Virginia football quarterback Bryce Perkins’ 27-yard heave to the end zone fell incomplete, clinching a 20-16 victory for Indiana University on a soggy night in Bloomington. UVA had a chance to return to Charlottesville with a win and secure its first 2-0 start since 2012; however, big plays surrendered by the defense, an inability to contain Indiana’s freshman running back, and a struggling offense ultimately doomed the Cavaliers, who now instead carry a 1-1 mark heading into next Saturday’s home game versus Ohio. Virginia started well offensively, driving 71 yards in 11 plays in the game’s opening drive, which was capped off by a 1-yard touchdown pass from Perkins to Olamide Zaccheaus. The Cavalier offense sputtered the rest of the half, mustering only 53 yards and two first downs in the next five possessions before halftime, only crossing into Indiana territory once during that time. Meanwhile, Indiana’s offense responded to UVA’s opening score with two quick touchdowns of its own. True freshman running back Stevie Scott had a 40-yard touchdown run on IU’s first offensive possession, and the Hoosiers struck again only 34 seconds later, when quarterback Peyton Ramsey hit wide receiver Donavan Hale for a 9-yard score two plays after Virginia junior Joe Reed’s lost fumble on a kickoff return. Despite the quick 13 points, Virginia appeared to grab some momentum back when Cavalier senior safety Juan Thornhill blocked the extra point try, scooped it up and ran for two. But with the Virginia offense unable to produce, Indiana eventually extended a 13-9 lead to a 20-9 advantage late in the second quarter, when Ramsey connected with Nick Westbrook on a 23-yard touchdown pass. The touchdown punctuated a 3-play, 74-yard drive for the home team, whose previous three possessions had resulted in punts. The visitors would answer, though. Indiana’s first drive of the second half resulted in a blocked field goal, and Virginia capitalized with a 7-play, 71-yard drive that ended with a 20-yard touchdown pass from Perkins to junior running back Chris Sharp. Bronco Mendenhall decided against going for the 2-point conversion and settled for the extra point, which brought his team to within four at 20-16. The Cavaliers captured more momentum on the first play of Indiana’s ensuing drive, when Thornhill intercepted Ramsey at the Indiana 37. A questionable holding call on Dillon Reinkensmeyer negated a 9-yard run on first down from Perkins and Zaccheaus dropped what would have been a first down on 3rd-and-20, squashing the drive, forcing a Lester Coleman punt, and slowing UVA’s momentum. While the Cavalier defense (and special teams, thanks to the block) would hold Indiana scoreless in the second half, the Hoosiers did manage to sustain drives and run clock. As a result, Virginia would have only three offensive possessions over the course of the final 6:37 of the third quarter and entire fourth quarter. Virginia punted twice before the game’s final drive, which ended with Perkins’ incompletion in the end zone. On 4th-and-5 with 16 seconds remaining, Indiana was called for a pass interference that gave Virginia possession on the IU 27. Unfortunately for the Hoos, on the fourth down play an Indiana defender intercepted Perkins’ pass and proceeded to run out the clock, which left the visitors with only an untimed down to try and capture the win. Perkins completed 12-of-24 passes for 106 yards and two touchdowns and rushed 25 times for 123 yards, including a long of 47 yards on the game’s first drive. Running back Jordan Ellis added 63 yards on 12 carries as the Hoos rushed for 188 yards in total. Hasise Dubois led Virginia in receiving yards with 49, while Zaccheaus led the team in receptions with 15. Aside from the touchdown, this was not Zaccheaus’ best night, as the senior totaled 9 yards of offense (15 receiving, -6 rushing) and had several dropped passes. Virginia had 301 yards rushing last week against Richmond, but against Indiana the Cavaliers managed only 294 yards total and were only 7-of-16 on third down conversion attempts. “We weren’t making routine plays, routine blocks,” Zaccheaus, who included himself in that group, told WINA’s Jay James postgame. Starting in place of the suspended Morgan Ellison and the injured Cole Gest, Stevie Scott, who rushed for 70 yards on 20 carries in his college debut versus Florida International, churned out 204 yards rushing and one touchdown against Mendenhall’s defense. He rushed for 140 yards in the second half, allowing the Hoosiers to rack up the time of possession. Much of his damage was done right up the middle of the Cavalier defense. Scott was the surprise freshman who beat Virginia this year. Last year it was Ramsey, who was a redshirt freshman at the time. Indiana’s signal caller, now a redshirt sophomore, completed 16-of-22 passes for 150 yards with two touchdowns and one interception Saturday evening. He also rushed for 27 yards on nine carries. Hale led all receivers in the game with 56 yards receiving and the touchdown that put Indiana up for good. Safety Joey Blount led Virginia in tackles with 13, 12 of which were solo, but was flagged for multiple pass interference calls on the night. The Cavaliers were penalized five times for 56 yards. Virginia allowed Indiana to convert 8-of-15 on third down and rack up 21 first downs in total. The Hoos surrendered 9 first downs and allowed 2-of-10 third downs to be converted in last week’s win over Richmond. “Just watch film, be pissed off,” Perkins told James, discussing how the team should respond next week versus Ohio.